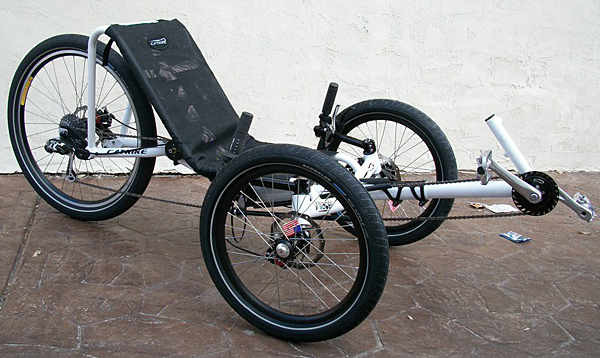 You can now convert your Pre-2013 Catrike into a different machine. With the bigger rear wheel you will roll faster and have a smoother ride. Many people already have their own wheels and idler parts, so we have seperated the parts out that you will need in the above drop-down selection. Most people will need the Basic Extension Kit, a Chain Rerouting Kit, a Wheel, and Tire. Kits are described below. Tires and tubes are available seperately from our Catalog. Also, Installation will require standard allen wrenches and a crescent wrench. 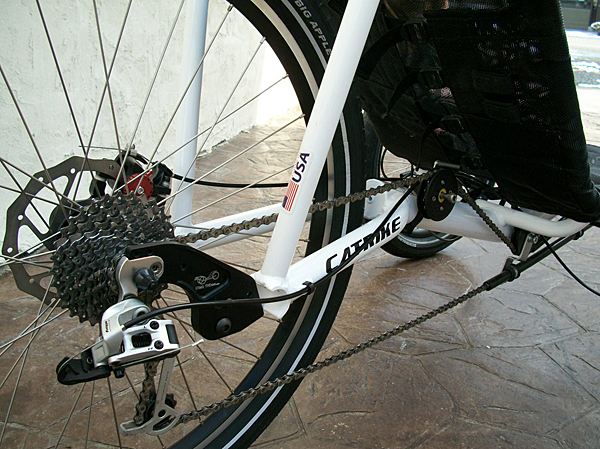 Cassette swap or chain length may require special tools as well. 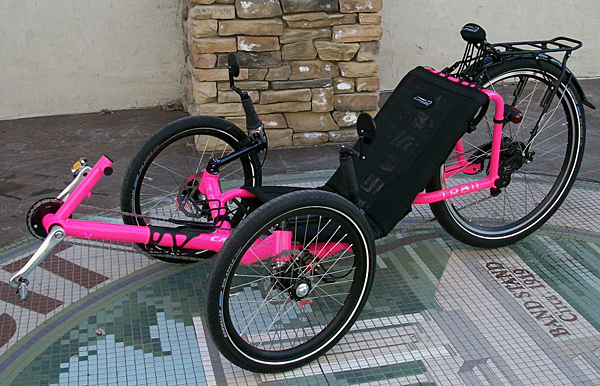 Our extension kit was designed to use the more popular 26-inch rear wheels, but we have tested it to work with 700c wheels on most of the 20-inch Catrike models. Installing a 26 or 700 wheel on the 2012 Trail with the adjustable seat will limit how far back the seat can lay down. 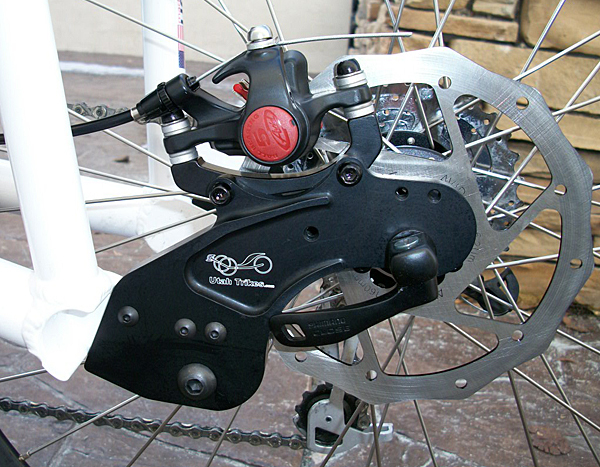 One of the cool things about our extension kit is that it allows you to add a rear disc brake that can function as a parking brake. If you would like a premade kit with a parking brake lever you can choose that option above. - We have had many users use this kit to put 700s on their Speeds, but due to variations over the years on the Speed model the 700 wheel may not fit. Don't ask us if it will allow you to put a 700 on your Speed because we do not know. About the Kit: Catrike owners have been asking us for these for a couple of years and after nearly 6 months of design and prototyping we have finally finished this project. The results are fantastic. We have created a very nice extension kit that will allow you to put a 26 inch or 700c wheel on your 20-inch Cat. So, what am I talking about? Well, let�s suppose that you bought a Catrike Road and then the Expedition came out. Well, you really like the Expedition with its longer wheelbase and larger rear tire, but you have a lot invested in your trike. Up until now your only choice has been to sell the road (or give it to your significant other) and then buy an Expedition for yourself. While there is nothing wrong with that (after all, we are more than happy to sell you an Expedition) it may not be in your budget. The basic kit includes the machined extensions and bolt hardware. 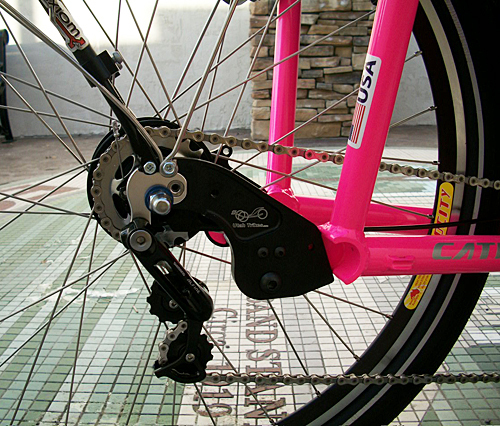 The kit is designed to work with a standard 26-inch wheel with the appropriate chain rerouting kit. Our extension kit is setup with the OEM mounting for a Rohloff hub. The extension kit does not change the width of the dropouts, so it remains at 135mm which will work well with most 26-700 wheels. NOTE: In mid/late 2004 Catrike started using the newer dropouts found on current models. These extensions will only work with these current/newer style dropouts. IT HAS COME TO OUR ATTENTION THAT SOME OF THE DROPOUTS USED ON PRE-MARCH-2008 MODELS HAVE 3MM DIFFERENCE ON THE TOP CIRCULAR PIECE. THE REST OF THE DROPOUT IS THE SAME. IN ORDER TO FIT THE EXTENSIONS ON IT WILL BE NECESSARY TO MAKE A SMALL CUT IN THE EXTENSIONS TO GO AROUND THIS PART. A DREMEL TOOL, DRILL BIT, OR FILE WILL WORK. THIS PROCEDURE IS SIMPLE AND SHOULD BE DONE IN WITH THE INTENDED TRIKE AVAILABLE FOR ACCURACY PURPOSES. "having a 26" wheel makes it so that i can go very fast"
"I rode my trike from New Hampshire to Virginia on one of the smaller wheels and having a bigger one would made things lots better."